Wisconsin Gov. Scott Walker has built a formidable political position ahead of next month’s recall vote. Gov. Scott Walker’s dominant position in Wisconsin is a thing of wonder. 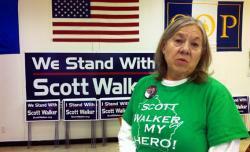 Lillian Nolan, a volunteer at a Scott Walker Victory Center in Fond Du Lac, Wis.
OSHKOSH, Wis.—If you get bored in Wisconsin, play a game. Drive a few miles through any neighborhood. Count the signs that read “We Stand With Scott Walker,” or “I Stand With Scott Walker,” or “Scott Walker: Believe in Wisconsin.” Try and figure out what the houses have in common. The public displays of affection for Walker can put you in mind of October 2008, when placing a HOPE poster or Shepard Fairey print in your window told neighbors about your politics and taste. The Walker gear is easily attained at one of the 20 “victory centers” promoted by the campaign. I stopped by half a dozen of them—local Republican offices temporarily converted to the cause. In the front of the Winnebago County office, a digital sign counted down the days to the June 5 recall. A cardboard Walker stand-up faced visitors from behind a podium. A handmade sign portrayed two cartoon burglars looking around as they hauled bags of pilfered goods. Inside, a 61-year-old grandmother named Diane Malecki was putting pro-Walker buttons in a tackle box. She would sell the gear at this weekend’s Republican conference in Green Bay. While we talked, a supporter bought one of the buttons Malecki had designed: A sheriff’s star with the legend, Walker, Taxes Ranger. The Walker campaign—the one currently leading in polls—is what every Republican presidential candidate tried and failed to build. There’s a perfect link-up here between Tea Party, Republican Party, and megadonor. Walker’s TV ads run constantly; the Democratic ads don’t. Walker’s swag is everywhere, paid for by $25 million in donations, two-thirds of which dropped in from outside Wisconsin. Tom Barrett, Walker’s Democratic competition, has raised less than $1 million. The yawning money gap grew out of a loophole in campaign finance law. From the start of the recall process until the date the election was official—five full months—Walker’s campaign was able to raise unlimited money from any source. Sheldon Adelson cut him a $500,000 check. Diane Hendricks, one of the state’s richest women, gave Walker $510,000, becoming the biggest donor to a single candidate in state history. Democrats have responded the way that massively out-spent people must respond: They’ve made a vice out of it. On Thursday, they shot up flares about a video, from 2011, in which Walker confidently told Hendricks about his “divide and conquer” strategy. Walker’s been answering that sort of attack with the script he wrote back during the union-led Capitol coup. The “they” in any given Walker sentence is the labor movement. Labor isn’t shy about this: It beats Walker or it’s hobbled, probably for good, in power and in reputation. So Republicans aim to divide them. They point to the post-primary unity rally—labor locking arms with the victorious and defeated Democrats—that these guys were supposed to hold in Madison. Forty-eight hours before the election, Democrats scrapped the rally, announcing that their candidates would have breakfast at the winner’s house instead. Labor would go ahead and rally at the Capitol. On the ground, there isn’t any real Democratic division. Organizing for America is pushing its staff and activists to work on the recall. But labor-backed Kathleen Falk blew $4 million on a campaign that lost to Barrett. The outside groups helping Walker haven’t wasted a cent. Americans for Prosperity, the national Tea Party group chaired by David Koch, has spent $3 million on ads bucking up Walker; it’s got grassroots organizers across the state. Its last campaign ad went on air in conjunction with the MacIver Institute, a think tank that opened its offices in a Capitol Square high-rise just three years ago. MacIver sends video reporters to protests, often coming away with Breitbart-friendly proof of labor or Democrats behaving badly. One example from 2011: footage of pro-labor doctors offering bogus notes to protesters who wanted to take sick days. On Thursday, MacIver President Brett Healy met me for iced coffee on the square. The conversation was interrupted, occasionally, by the small-but-loud anti-Walker rally that happens every weekday at noon. Walker’s supporters agree with a vehemence you rarely find in state elections. On Tuesday, as Walker—surprisingly—got nearly as many votes as the Democrats running against him, I visited a few polling places and met the people toting the free signs. Scott Perzentka, who runs a pier-building business, voted for Walker in Oshkosh, then headed back to his truck with Walker and biker’s-rights signs. Perzentka survived a horrific motorcycle crash in 2003. The experience made him a kind of activist. As he rebuilt his life, it also reinforced his belief that people had to earn what they had, and that unions existed to puff up the salaries of people who didn’t work.